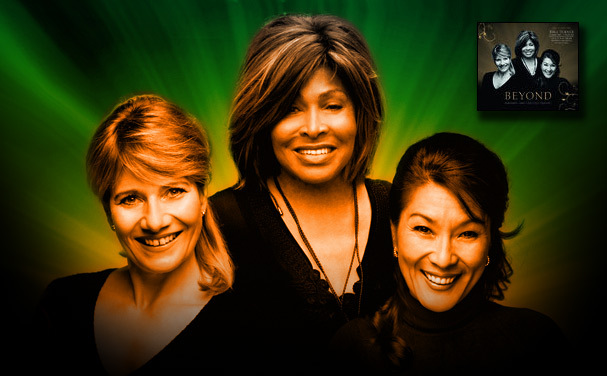 Long time Buddist Tina Turner has released a Buddhism and Christian album titled "Beyond". The album is a very spiritual and peaceful album unlike any other album she has recorded. The album was released in 2010 in Europe. New Earth Records proudly presents this collaboration of talented musicians - Tina Turner, Dechen Shak-Dagsay and Regula Curti - sharing a vision that reveals the oneness that is within us all. The CD features a 6 page digipack and a beautiful 36 page booklet. With the CD Beyond New Earth Records wish to share their vision that whoever we may be, whatever religion we may come to - when we pray and our prayers come from the deepest of our hearts, a transformation takes place and we find ourselves 'Beyond right and wrong'. We experience the immense power of deep spirituality whenever we chant together although each person is praying in his own tradition. In this CD we have Tina Turner chanting three Buddhist prayers and a spiritual message, Dechen Shak-Dagsay singing Buddhist prayers, and Regula Curti singing Christian prayers.